U.S. Bank has officially just launched their new Altitude Reserve credit card. As is tradition, it’s time for our in depth review of this new premium credit card. 2.1 Who is eligible for this card? 2.2 What Credit Bureau Does U.S. Bank Pull For The Altitude Reserve? Annual fee of $400 for the primary cardholder. Authorized users can be added for $75 each. $325 in annual travel credits. This is based on a card member year, rather than calendar year. You can get the above requirement waived by applying in branch (you still need to be a U.S. Bank customer, but business is fine and the 35 day waiting period is waived). What Credit Bureau Does U.S. Bank Pull For The Altitude Reserve? This varies by the state you live in, you can view more information about this here. This varies from person to person. The minimum credit limit for this card is $5,000 (lower than the $10,000 limit required for other Visa Infinite cards). You’d expect significant card benefits for a card with a $400 annual fee. Let’s go into detail for each benefit this card offers. It doesn’t matter if you make the purchase with the primary or authorized user card it will still trigger the credit. Keep in mind the authorized user does not get their own $325 travel credit. The credits are applied automatically and you shouldn’t need to do anything for the credit to appear (as always it’s a good idea to keep an eye on this to ensure it does post automatically). These passes are valid for 12 months from the date that you register your card. Each flight segment (takeoff and landing) will use up one of these passes. Can enroll one card member in the program at a time. You can receive a statement credit of up to $100 when you use your card for the application fee on Global Entry or TSA PreCheck. You’re able to receive this statement credit once every 4 years. Rent an Audi A4 with no lines or paperwork from airport locations in select cities and receive a discount of up to 30% on rentals of two days or more. An example of what you receive can be found on the website for the Wedgewood Hotel. Card is made from metal. This card has a sign up bonus of 50,000 points after $4,500 in spend within the first 90 days. It’s possible to transfer FlexPerk points to Altitude points, but not vice versa. Keep in mind that FlexPerks have a maximum redemption value of 1.5¢. Real-time rewards lets you redeem points for 1.5¢ per point, more details here. You can redeem points for airfare, hotels & car rental at a rate of 1.5¢ per point. Keep in mind that you need to use their booking system and that’s far from perfect. Usually it prices the same as elsewhere or by booking directly and you’ll still earn airline miles/credits. Instead of paying the $400 annual fee in cash you can offset it by paying 35,000 in points for a value of 1.14¢ per point. Can also be used for authorized users. You can redeem points for statement credit at a rate of 1¢ per point. I don’t think travel credits are worth the same amount as straight cash, but even at 80% of face value that’s $260. Worst case scenario you use 35,000 points to offset the annual fee leaving you with $150 worth of points and $325 ($260 ‘cash value’) in travel credit. By no means the best bonus ever, but well worth applying for. Obviously if you value the card benefits (and I think they are very weak) then the value proposition gets even better. What’s really interesting for me and a lot of other people is the ability to get 3x points on mobile wallet purchases. This could be amazing for manufactured spending (and regular spending if you just use Visa gift cards purchased with this for your regular purchases) depending on what stores near you accept mobile payments. Even better for people with eligible Samsung Phones as the MST technology means it can be used on most swipe only payment terminals. We also took a look at the cheapest way to get Samsung Pay in this post. I personally don’t think this card will be worth keeping after the first year for the majority of people, unless you can really make use of the 3x categories. Let me know if you agree/disagree in the comments below. Follow-up note: US Bank has been aggressively shutting down accounts of those who buy Visa gift cards. Steer clear. If you apply and want to share data points, please do so here. Read these things everybody should know about U.S. Bank credit cards here. They are offering 500 points for enrolling in real time rewards. When you call in to activate your card tell them that you would also like to activate it for use in a mobile wallet. I’ll answer the more commonly asked questions here. All this really depends on how sensitive US Bank will be to MS on the mobile wallet category. The prediction is still that they will nerf it 1-3 years down the line, as USB is known to do. But if people can get away with repeated $500 transactions at drugstores/supermarkets/gas stations, then the value proposition is very high for MSers. USB is definitely not for $10k/day volume, but what about $5k/month? $5k MS at 3x a month would be $2700 for travel a year, making this card a real keeper. Even at levels of $2.5k a month, it’s well worth it at $1k profit. bob. you dont need to bother wondering how sensitive USB is to MSing. the answer is yes. you just need to be DL about it if you want to MS low volume with them. anything more will get too much attn. USB is a slaughter house. think about them closing buxx. closing all accounts based on recent inquiries and closing all accounts based on MO deposits. MS on their CC is no different. Did they close all accounts based on MO deposits to a USB checking account? Cause I’ve done a ton of that…am I boned? You’re overstating the profit at 5k month volume, you need to compare to putting it on a straight 2% (or even 2.5% or 3% these days) cards. I agree it might be a keeper for some though that can make use of that category. As a heavy Samsung Pay user, I will keep this card indefinitely so long as the travel credits are easily usable and redemptions at 1.5 cpp are worthwhile. So, the cheapest way to get Samsung Pay/NFC is around $200…the extra 1x earnt with this card above an ordinary 2% card would mean I’d need to spend $20,000 through Samsung Pay to break even. Given the shutdowns for GC, I think I’ll just harvest the bonus and move on. After redeeming the annual travel credit of $325, there’s only $1,667 left in Samsung Pay spend, redeemed at 4.5%, to recoup the remaining $75 of annual fees. Samsung Pay alone is a pretty good incentive to keep, since it reportedly works everywhere. Heck, I’m switching from Apple to Samsung for this. That, and no one could hardly hear me on the XS. Shoot, audio had better be tip top for a thousand dollar phone. Unboxing the new Galaxy today. Muhuahha! Just to clarify, Altitude Points can be redeemed at 1.5 cpp for airfare, hotel and car rental (not just airfare), right? Personally, with airfare handled by award redemptions, Citi Prestige annual credit, discounts from Ritz Carlton Visa Infinite, incidentals covered by Ritz Carlton and Amex Platinum, and the opportunity to use purchase airfare with other flexible points programs (UR and MR), I’m feeling well covered re airfare and air travel incidentals. It’s the other travel costs – hotels, cars, trains, sightseeing tours – that are still bit harder to cover with points. 1.5cpp would be great for hotels etc. 50,000 points can be redeemed for $750 in airfare, hotel stays or car rentals. Not sure how it works in practice. If all redemptions are handled through their online portal then it’s that much more attractive. Updated, thought it was just airfare but seems you’re right. I get hotels at a 20%+ discount most of the time though so airfare only real attractive option for me. I think before usbank cuts the benefit, this card is a good card, a 75 annual fee card can’t be better than this. The only thing I am worrying about is their services, I really don’t think they can be compared with Chase or AMEX, even same service,. even 100 annual fees card is better than others, all high level credit card holders must travel a lot, otherwise you are not targeted or you don’t need it, so the credit it worth! I even can fully use Ritz card’s credit fully. I think the only problem is that, when they cut the benefit, I do think no later than this year, it is easy for the MSers like me to ms 10000 per mouth. Why don’t you consider travel credit the same as cash? You can still get Uber/Lyft at a discount, even buying Uber GC from Amazon is a 8% discount when you account for 3x jetblue points and a 5% card. I’d have to imagine for a lot of people, travel credits are basically equal to cash. Presumably people are holding this card in part because of its 4.5% returns on travel, and put travel expenses on the card right? Yes, sure there are a lot of ways to acquire discounted gift cards for travel, but there are time costs associated with those and, importantly, not all travel can be paid that way. If someone is going to have $325 in travel expenses otherwise billed to their credit card as travel, then this credit is basically cash, especially since they’re still getting 4.5% back on it. I realize that might not be everyone, but it’s going to be true of basically every frequent traveler. I think we will have to agree to disagree. In any case if somebody wanted to sell you $325 in travel credit, would you pay $325 in cash for it? I think the answer to that question is no. If you agree that it is no, then we’re just squabbling over the discount that should be prescribed. Will, with all due respect (and I do mean it), your logic here is somewhat flawed … let’s take it to the next level. Would you pay $325 cash for $325 credit of any type? Let’s say you get straight statement credit for that amount? I would say “No”. Why would you pay cash, just to get that money back with no profit? Following your logic you would not value a straight statement credit with no strings attached at a face value, would you? Not arguing, but would be interested to hear if you would value a straight statement credit at a face value. Very grateful for all your time, effort and amazing blog!!! All the best to everybody at DoC. Happy New Year!!! I wouldn’t pay $325 for a $325 statement credit, you’re right. But I might pay $324.90 for example. The thing is it’s so easy to get discounted travel, valuing travel credits as cash is absurd. Like I said, I’m happy to agree to disagree but I think a lot of readers like to justify travel credits = cash as it helps justify their decisions. Old point, but I tend to value travel credit as cash due to the ability to book a refundable ticket and cancel it right away while keeping the statement credit. I do this with my Chase credit, but not sure if U.S. Bank’s system is more sophisticated and would take back the credit, etc. Ultimately, I eventually use the credit, but I like it upfront and this allows me to not have to wait. In such a case do you think it’s still less valuable than cash? Jukian Banks – Did you have success with this? I think it’s worth mentioning “bulk fare” and “basic economy” through U.S. bank portal. Also, even though Altitude Reserve has travel protection, there is subtle difference in the insurance among high end cards. Assume you have a two-segment flight. Also, the first one is delayed and you are not able to make it for the second segment. If you choose to rent a car or call a cab because of the the work tomorrow, you will not get reimbursed with the CS(R) but will do with Citi Prestige. I’m not sure Altitude Reserve has which type of insurance. You mean that you can offset the AU cards with points at the same rate? Or paying with 35,000 points covers all AU? Some people have reported the credit line as minimal as $1000 in reddit. That was just one DP right? Just ordered a Samsung gear s3 for this card. Will fidelity visa card owner be counted as us bank customer? Not 100% sure, sorry. ANybody know? It is offered by Elan, while a usbank company it is not considered a us bank card. The one and only selling point on this sub-par cc is the x3 mobile which will be a mute point very shortly. Other banks are not going to sit still and will have offerings are there own or amendments to their existing rewards cc’s. I would not waste my time with a bank who is well known to nerf products fairly quickly. I give it 6 month tops before another major issuer like chase, amex, Citi comes in with their own offering and steal away US banks thunder from down under. Do the travel credits work for Uber/Lyft? US Banker on Reddit said they don’t know yet about that. I guess people will try and we’ll find out soon. Are the credits supposed to be in real time like the CSR or at statement time like the Prestige? USB rep said it depends on the MCC and she then proceeded to check Uber and Lyft and told me they would count. @Chuck – I’ve received credits for Lyft on the card. They’ve been posting within 2-3 days of the purchase posting. 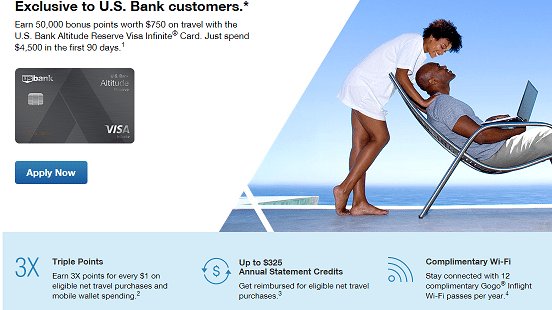 Need DPs on whether US Bank will allow you to keep $325 credit on cancelled refundable flights. It works on Prestige and CSR and Arrival+, so I assume it will here too. Especially if you cancel the flight after the statement in which you made the flight purchase, I don’t see them clawing back. But we shall see. Jags and/or Jack – Success with that? I don’t have any banking relationship with US Bank..does this mean I’m not eligible to apply? You need to have a bank account or credit card or some other relationship, as explained in the post. If you don’t, you can open a checking or savings account and apply 35 days later. Has anyone been able to check their point earning on this card? My balance says zero, so they obviously post after the statement close. I poked around on the website and can’t find a way to see the points earned? Will we have to wait for a statement? I shop at Walmart a lot (I live in Bentonville, AR) so I’m specifically interested to see if my Walmart Pay transactions are earning 3X. **Reward point balance is zero. I have had transactions post. waiting for your dp. I also shop at Walmart a lot. My statement has posted and I can confirm that Walmart Pay does NOT earn bonus points. Apparently it is not considered an eligible mobile wallet payment. Very disappointing and I will not be keeping the card. Without Walmart Pay or any MS, this card is not a keeper. One more question, do you know if the $325 travel credit goes towards the $4500 requirement?